Kellie grew up in Winston with many pets including dogs, cats, and horses. 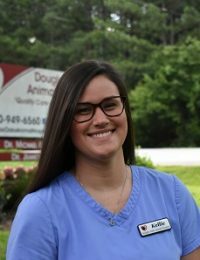 She has been working in the veterinary industry since 2010 and has an associate degree in veterinary medicine. Kellie has experience working with small and large animals and when she has free time, Kellie enjoys barrel racing and going to the lake.